Well here we are again! Gearing up for another school year. Coco begins grade 3 in just a few days and I’ve been reflecting on her growth over the years–oh how her personality has blossomed into a feisty, independent, creative and centered child. I have so much to learn from her. What I often forget to do is look at my own growth because I’m so focused on her, my husband, Paul, and my extended family. How about you? Do you take a moment every now and again to see how you have grown emotionally and spiritually? Well, today was that day for me and I can sincerely say that although it doesn’t seem like anything ever exciting happens in my life that is certainly not the case. Somethings are like little subtle steps and others are like gigantic leaps. The first thing I’m very proud of having done is starting this blog. Right after I graduated (with honors, yay) from the Academy of Culinary Nutrition back in 2016, I was gung ho to get out in the world and change the nutritional habits of people one workshop at a time. Only that didn’t happen. It seemed like we were always planning a trip or heading up skiing or visiting family back in Alberta. Next thing you know, a half a year had passed and I was feeling panicky. I couldn’t let my new found wisdom sit idle. So over the next few months I decided I would dedicate some time each day to learning how to create a blog. Thankfully my husband was there every computer keystroke of the way. By November I had written enough blogs that I was ready to throw up the site and see how it fared. Next, I needed a plan that I could follow to continue posting new blogs. As always, when you break an insurmountable task down into small little feats (think of the movie What About Bob with his “baby steps”) the task becomes manageable. Instead of thinking I will do 56 blogs this year–sometime, when I get around to it–I thought I will do one a week. Now that kind of breakdown is much more do-able–less daunting. So let’s get to my recipe for this week and how it ties into my little personal growth sojourn. 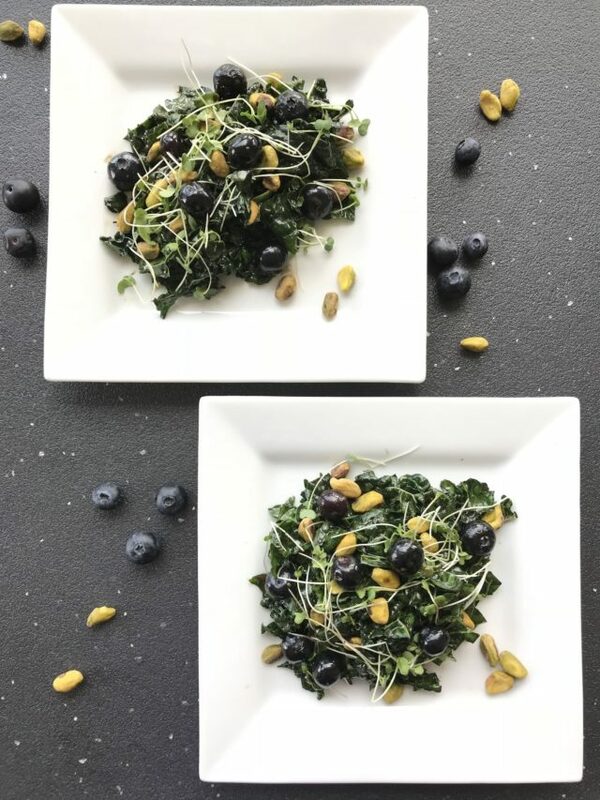 When I first started the Academy of Culinary Nutrition, I remember Meghan, the instructor and all around nutritional head guru of the program, saying that all nutritionists had their own special kale salad. This, my lovely reader, is mine. Enjoy! And as you are consciously eating with intention think: I can accomplish whatever I set my mind to ONE STEP AT A TIME. 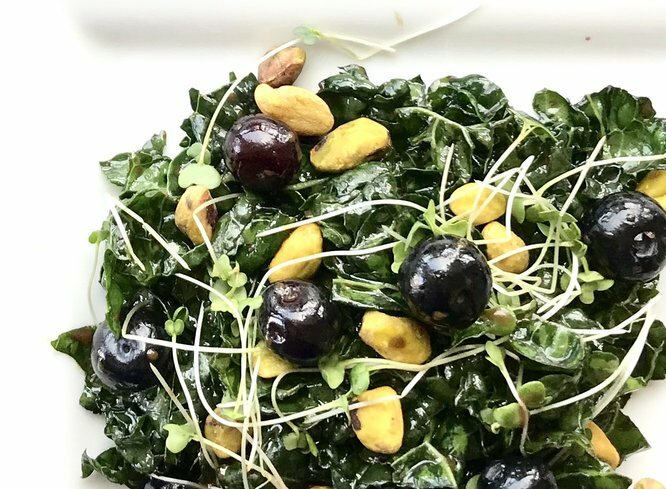 Kale is so loaded with nutrients it's hard to let a week go by without enjoying it one way or another. My favorite way is as a salad but beware if it's not tamed (massaged) then it might be too bitter for you. Step 5 Serve with Love and Enjoy!